Details the area aroun the Prismatic Spring! Excelsior Geyser Basin. Geology Sheet XXIII. 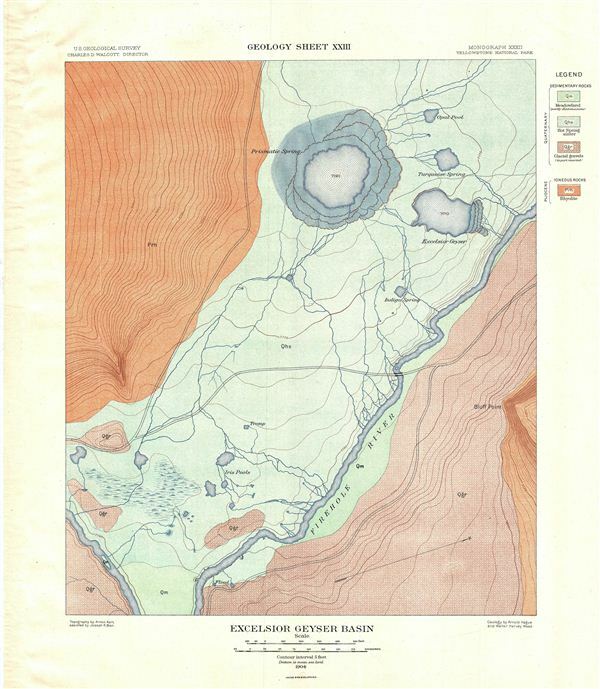 A fine example of Arnold Hague's 1904 geological survey map of the spectacular excelsior Geyser Basin in Yellowstone National Park, Wyoming. Focusing on the excelsior Geyser, the map covers the Midway Geyser Basin from Firehole River northward to the Opal Pool. The map identifies many geysers and springs, most famous being the breathtakingly beautiful Grand Prismatic Spring, the third largest hot spring in the world and the largest in the United States. The excelsior Geyser shown near the Prismatic Spring, was known to be one of the largest geysers in the world until the 1880's, with eruptions frequently reaching heights of 300 feet. It is now a productive thermal spring. This particular map was part of Hague's study of the regions unique geology and the related geothermal activity. The map is color coded to identify different geological zones with a detailed key to the right side of the map proper. Published by the United States Geological Survey in 1904.